Just a small update, since we published this article Deborah Jane Higgins changed her social media name in an effort to throw people off and so that this article would not be linked to her in google searches. This article was originally published in September 2014, and the information contained will refer to her under the name she was using then. I republish this article due to the fact she has been getting some media attention and that people need to be aware of the truth about her and her claims, as well as her history. The following article was sent to me, the author wishes to remain anonymous due to the aggressive nature of the psychic being talked about, as such you can direct all your abuse to me on Twitter @JonDonnis Please enjoy my little disclaimer below, as we all know how much these psychics like to use Disclaimers! I have pondered long and hard about whether I should write this article, and come to the conclusion that it is in the public interest that I do so. There are two reasons for this. Firstly because I think there is a chance that vulnerable and grieving people might be ripped off. And secondly because of something which happened last year that I found extremely disturbing (this is detailed at the end of this article - under the section entitled Madeleine McCann Claims). I therefore ask all readers to carefully consider the evidence that I provide here, do more research as they see fit, and then make up their own minds about this person. 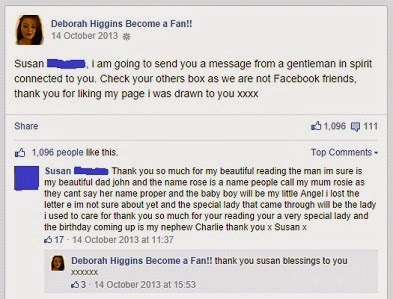 Sometime last year, I happened to come across a Facebook page called “Deborah Higgins Become a Fan! !” It is run by a self-proclaimed psychic/medium by the name of Deborah Jane Higgins, who is also known as Deborah Jane McDonald (her maiden name) or Deborah Jane Davies (as a result of her second marriage). Although I hadn’t heard of her before, I was astounded to see what a huge following she has. It has since swelled to over 140,000 Facebook “likes”. That's almost double that of Sally Morgan and around four times as many as Derek Acorah. As far as I can ascertain, Ms Higgins has managed to gather a huge number of fans even though she has not appeared regularly on TV, nor does she perform shows. According to my research, she simply ran a beauty salon in Stockport - which may have since changed hands or been dissolved since the official website given on the Facebook page no longer seems to work. 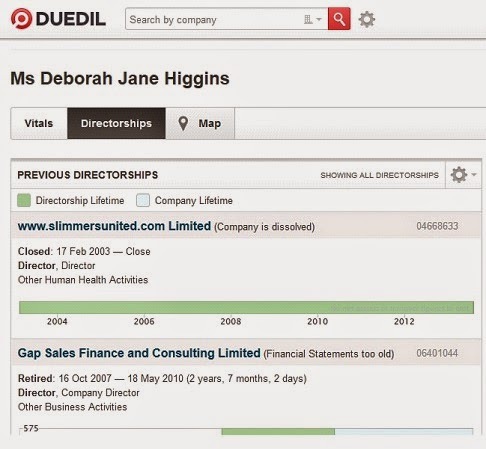 If it has been dissolved, then it wouldn't be the first of Ms Higgins' businesses to bite the dust. Funnily enough, I also came across this article which publicised her (failed) slimming business. No mention at all of her having psychic powers, even though Ms Higgins claims in one of her YouTube videos to have heard voices since she was young. One also wonders, if she was really psychic, why she didn't see the failure of her previous business(es) coming. 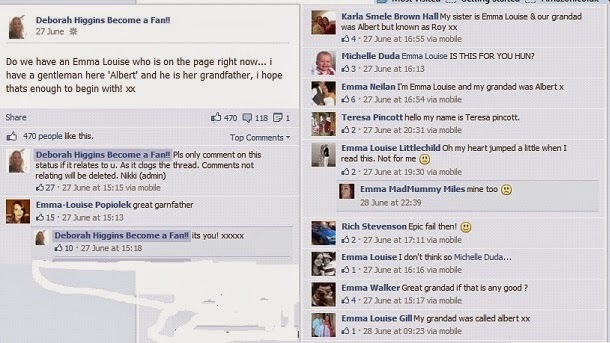 Note how she simply asked for someone called Emma Louise whose grandfather was called Albert. 1. Isn't it funny how the spirits are never able to say what their surnames are? 2. Isn't it even more strange that the spirit actually got his relationship to his descendant wrong (great grandfather instead of grandfather)? 3. What's particularly interesting, though, if you look on the right, is just how many people called Emma Louise this statement could have applied to! Theoretically, all she had to do was pick one of them! Again this is very vague, and the spirit isn’t even able to say for definite who he is – leaving the customer to supply the relationship. The name “Rose” is very common, and the letter “E” could be just about anything. This smacks strongly of cold reading, a technique which stage magicians or mentalists often use to convince the audience that they know more about them than they really do. So let’s get this right. 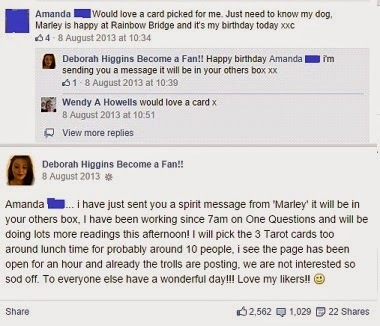 With her previous messages, Ms Higgins wasn’t even able to convey the exact full names of the people who had passed, yet here she has a spirit message from a dead dog?! I wonder what Marley had to say; “Woof! Woof! Woof!”? These were not the only assertions by Ms Higgins that some have found questionable. On her official website Ghost Antics (which has since been redesigned, but the info is still available here via The Wayback Machine), she made the rather grandiose claim that her mother was also a psychic/medium who had been responsible for locating one of the bodies of the Moors Murder victims, as well as working on the Ripper case. We will return to the subject of Madeleine McCann later in this article. 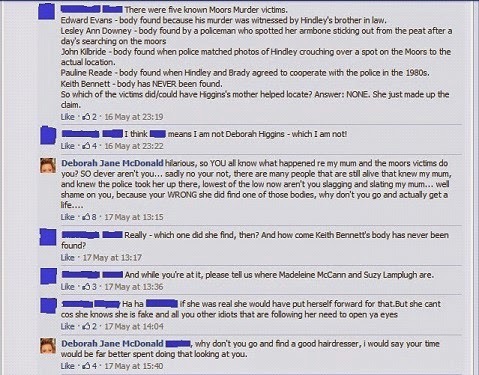 But I personally also find it highly unlikely that Ms Higgins' mother really managed to locate one of the Moors Murder victims’ bodies. I apologise in advance for linking to this video - as it is extremely graphic and distressing - but it also backs up what the challenger to Ms Higgins' claim said. As for the Ripper, again I don't personally see how a psychic/medium could possibly have helped in cracking that case. According to this link, it actually took over five years to apprehend Peter Sutcliffe. He had been interviewed by the police on at least one occasion – before they finally caught him red-handed with a prostitute in a car which had been fitted with false number plates. The investigation had been hampered in part because of a number of hoax messages sent to the police by Wearside Jack. Nevertheless, whether or not you choose to believe that Ms Higgins is psychic, there are other things that she has been accused of. 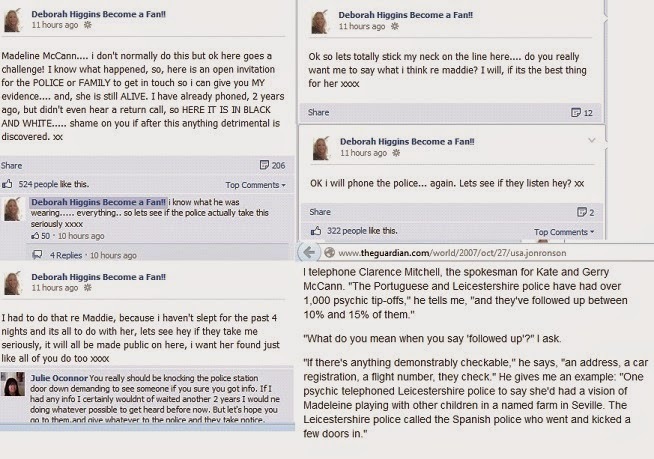 I came in contact with a group of former admin from Ms Higgins’ page (see their Facebook group here) who claimed that there were several clients who paid Ms Higgins for readings that they never got. Or found that the readings they did get from Ms Higgins were duplicates. Apparently, when the clients tried to make enquiries via Facebook, they were blocked. According to the ex-admin, Ms Higgins left them to deal with the unhappy customers - while she went off on holiday. The ex-admin then allegedly decided that enough was enough and "outed" her on the Facebook page. This version of events was also detailed on a now-defunct website, a copy of which can still be seen here, c/o the Wayback Machine. Now, in the interests of fairness, I have to say that Ms Higgins and her supporters claim that her Facebook page had been hacked. However, since the people who allegedly "outed" her were actually ex-admin that she herself had appointed, I'm inclined to think that "hacked" is inaccurate. Again, please note that despite claiming to be psychic, Ms Higgins apparently didn't foresee the problems with her admin team. There were also accusations from her side that this was part of a huge hate campaign because ex-admin were jealous and wanted to make money from doing psychic readings themselves. I honestly do not know if the ex-admin had ulterior motives, but let me assure the readers that if this does eventually prove to be the case, then I shall add this info to this article in due course. Nonetheless, there were one or two points on which Ms Higgins and/or her supporters have (perhaps unwittingly) agreed with the ex-admin's story. So, it seems to me that Ms Higgins has effectively admitted giving duplicate readings and blamed this on the other people picking the same cards. I will leave the readers to decide for themselves how likely it is that two people picked the same cards. I will only say that there are generally 78 tarot cards in total in each average pack. Thus, the odds of two people picking the same cards are less than the chances of a person matching the lottery numbers drawn each week. And the chances of winning the lottery are, incidentally......................................................1 in 14,000 000. 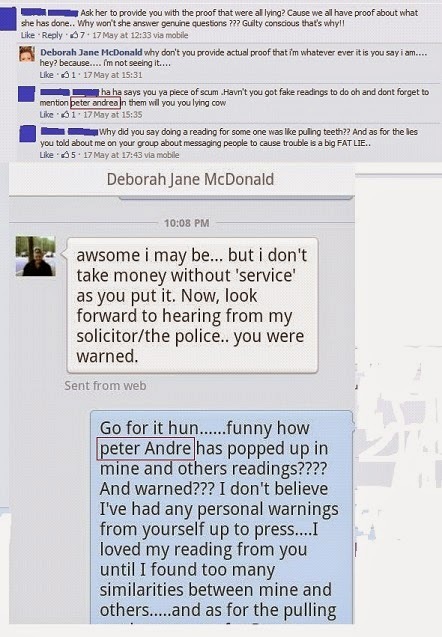 So here Ms Higgins' supporters are admitting that she was behind with her readings - yet she still went on holiday! Not something a professional would do - but again, make what you will of that. I think most of us must be aware of the tragic case of Madeleine McCann who has been missing since 2007. 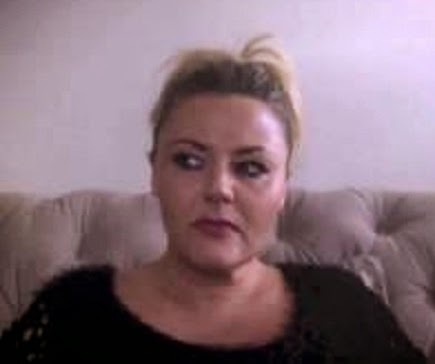 One thing I detest about self-proclaimed psychics is when they interject themselves into missing person cases and divert the investigation with misinformation - costing precious time and resources (see Sylvia Browne’s involvement with the Shawn Hornbeck case as one example of this). Note too that according to the McCann’s spokesman, Clarence Mitchell, the investigators look into anything demonstrably checkable - which would mean approx. 100-150 psychic leads in Madeleine's case. All of which, logically, must have been a waste of time because poor Madeleine is still missing. Make of that what you wish. I personally consider it to be evil! 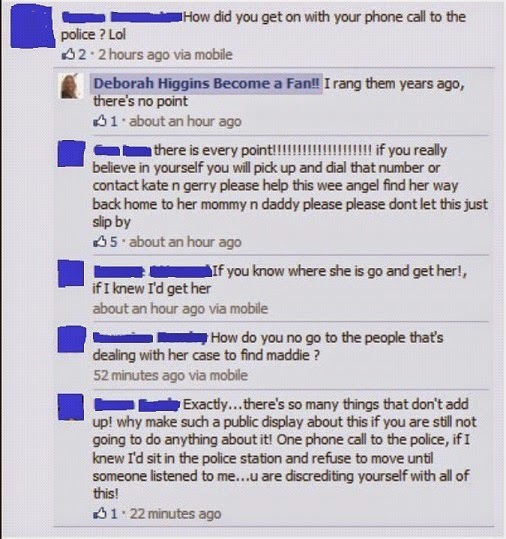 But see here that Ms Higgins claimed she knows everything, that Madeleine is still alive and seems to be blaming the police for not taking her seriously when she tried to contact them two years ago. But then again, I have found that Ms Higgins isn't always consistent in her claims. 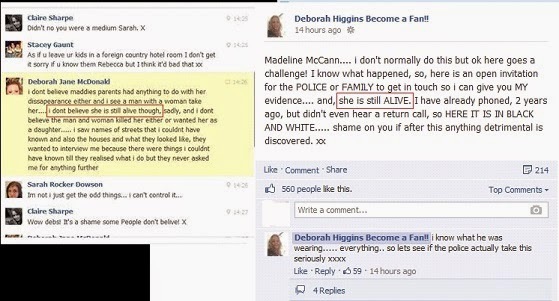 PLEASE take a look at this post (on the left) she apparently made about Madeleine McCann on 15 January 2013 and just see if you can spot the differences!! For entertainment purposes only. Mediums may contain traces of truthfulness when discussing available payment options. Thats a really well written post! So good I am gonna copy and paste it into its own article on the site so more people can read it!